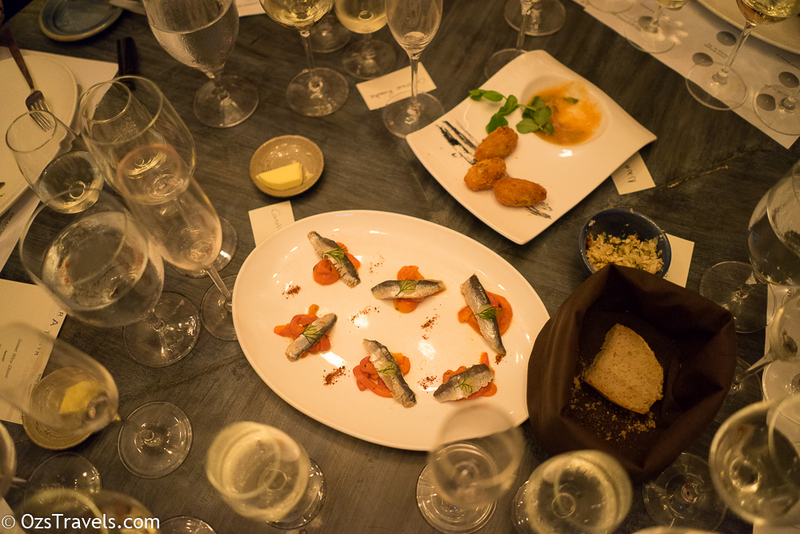 Recently I attended Wine Exchange Asia’s 2015 Grosset Wines Singapore Dinner at Bar-A-Thym. 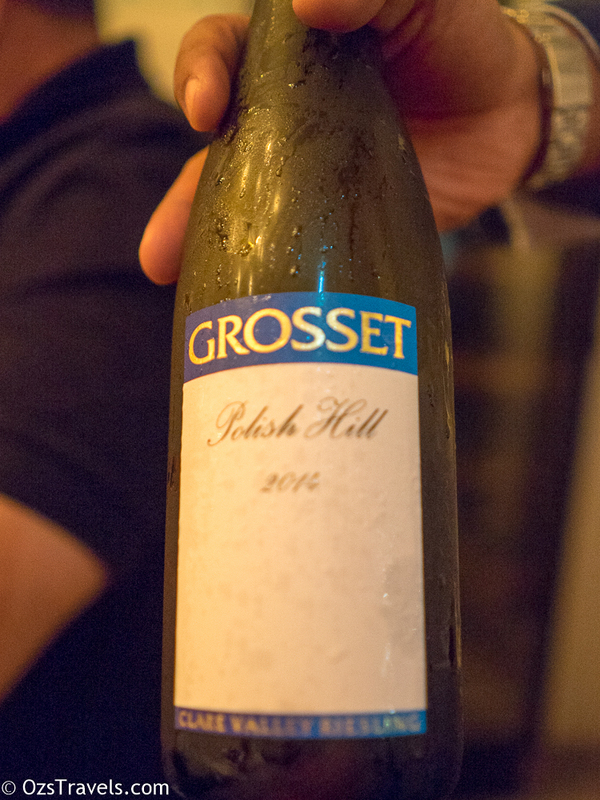 Grosset Polish Hill is my favourite Riesling, so I was really looking forward to tasting some of the recent vintages and to meet Jeffrey Grosset for the first time. Jeffrey taking us through the various wines and vintages, as well as explaining his reasoning for going organic well before it was fashionable. Jeffrey is recognised as one of the best wine makers worldwide and was voted the inaugural Australian Winemaker of the Year by Gourmet Traveller WINE in 1998, is internationally recognised as one of the ‘Top 10 White Winemakers’ (Decanter, UK) and one of the ‘50 Most Influential Winemakers’ (Wine & Spirits, USA) in the world today. 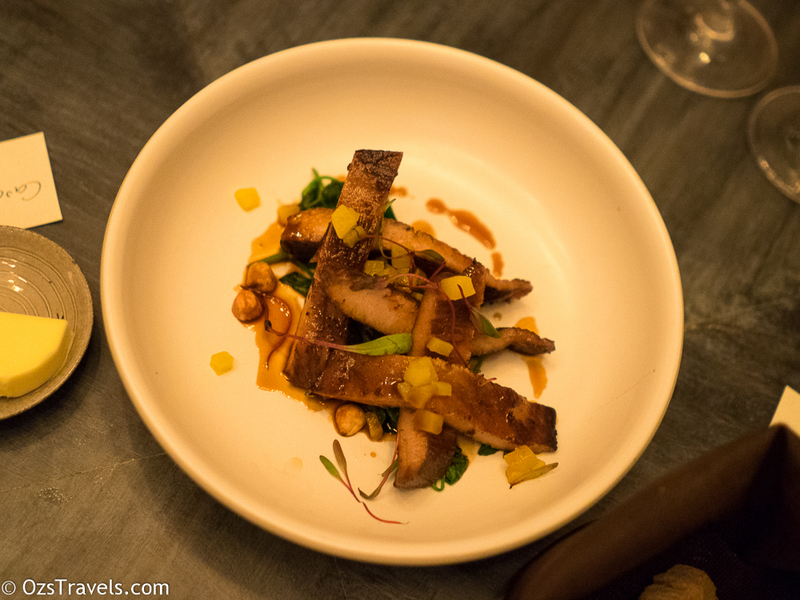 It was my first time at Bar-A-Thym and I really enjoyed it, will definitely be back. 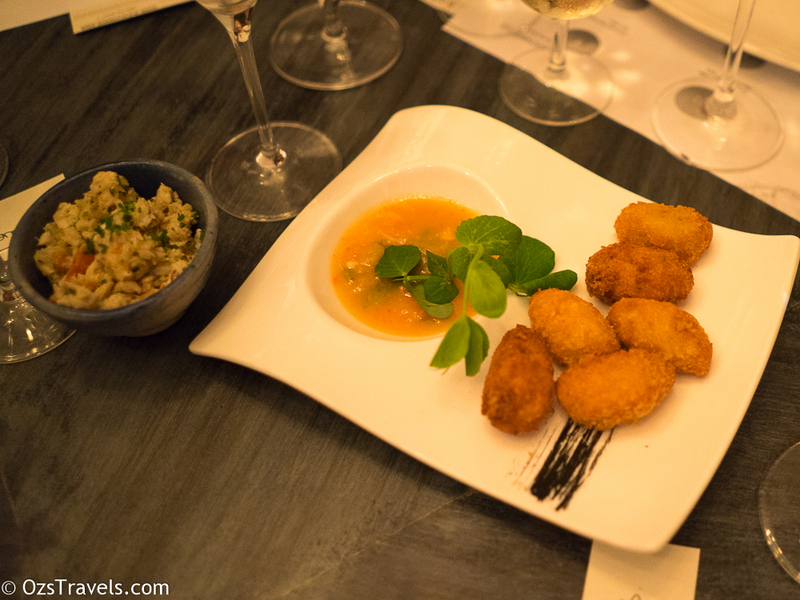 First up the food, Chef Francois Mermilliod did a great job of coming up with a menu that paired well with each of the wines, even the SSB! 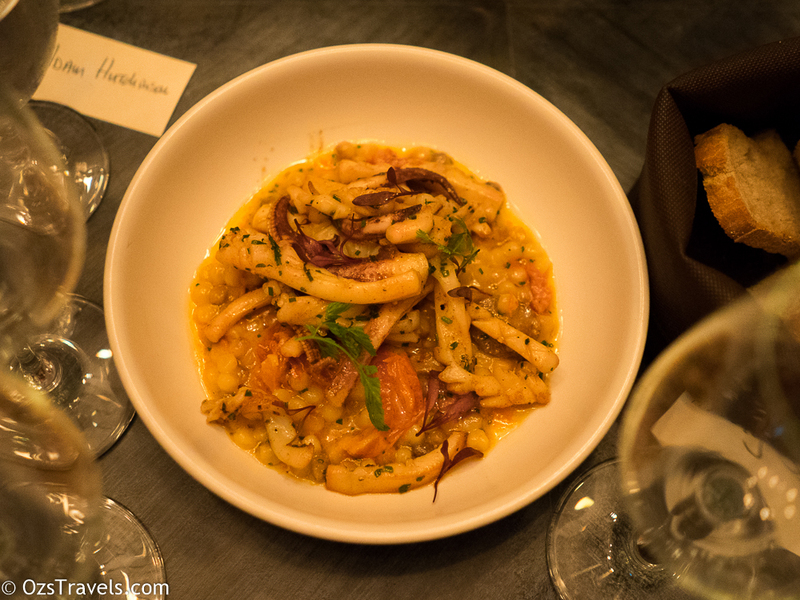 Interesting dish, a good way to start the meal. Most of the people on our table found these sardines to be very "fishy", I like "fishy" fish, so one of the other guys and myself finished them off. 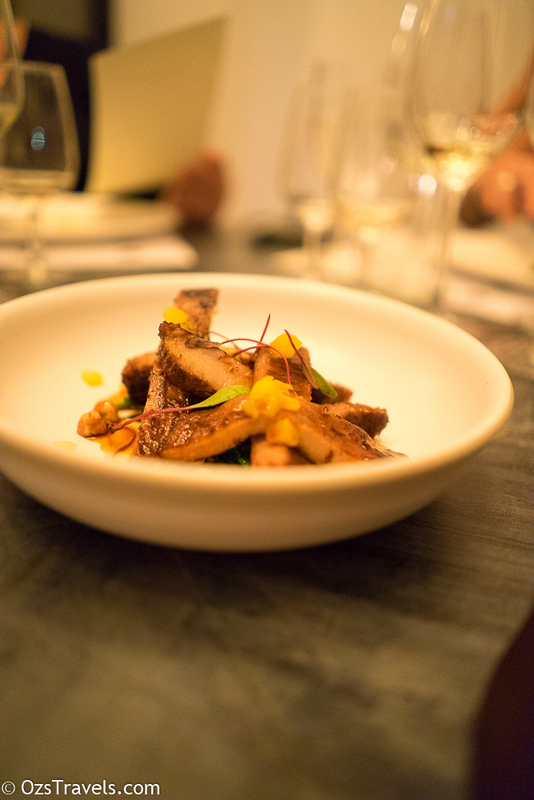 This was my favourite dish of the night, the only problem is that the other people at my table also enjoyed it so there were no seconds. 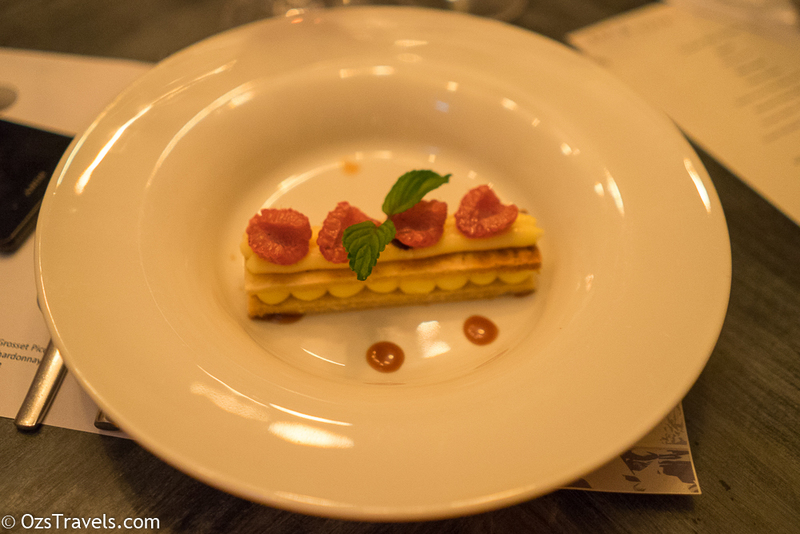 Only thing missing was a dessert wine, Mt Horrocks Cordon Cut would have worked well! This was the first time I have tried this wine, extremely enjoyable. Would recommend giving this a go! 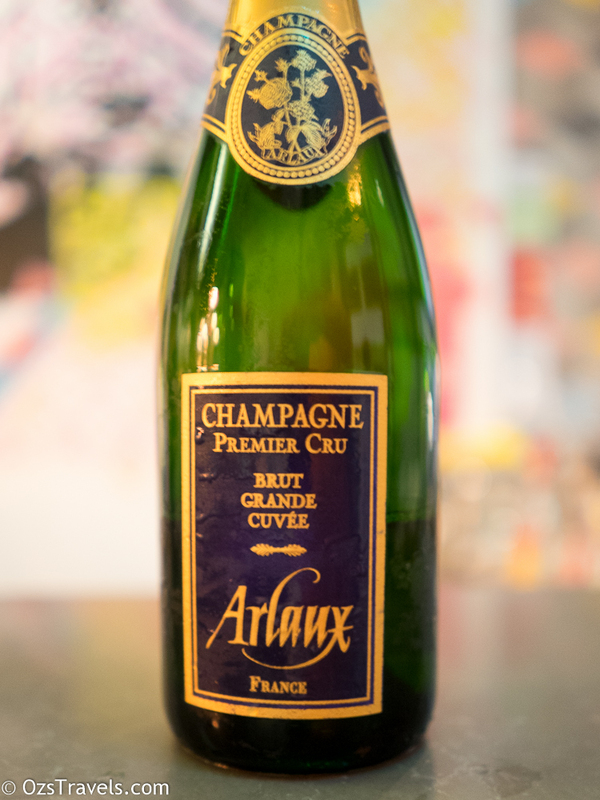 “Champagne Arlaux is a small family run estate in the tiny Premier Cru hamlet of Vrigny, on the Montagne de Reims. The estate grows just 10 hectares of vines and only grapes from the estate’s own Premier Cru vineyards are used, with a quiet commitment to putting quality first. I am not an SSB fan, and did not enjoy this wine a bit too sour for my taste. Was definitely better when paired with food, went fairly well with the sardines. Courtesy of the Grosset website. 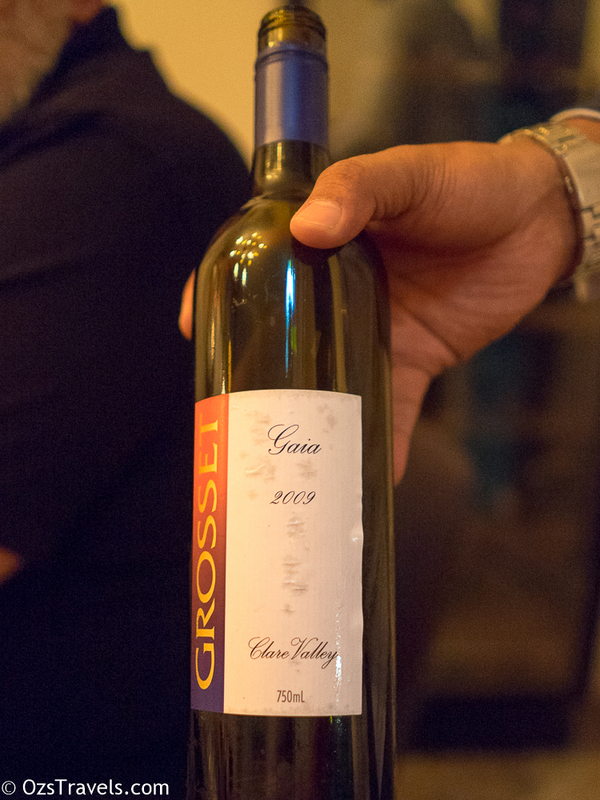 Grosset Wines is an independently owned winery producing seven highly regarded premium wines each vintage. 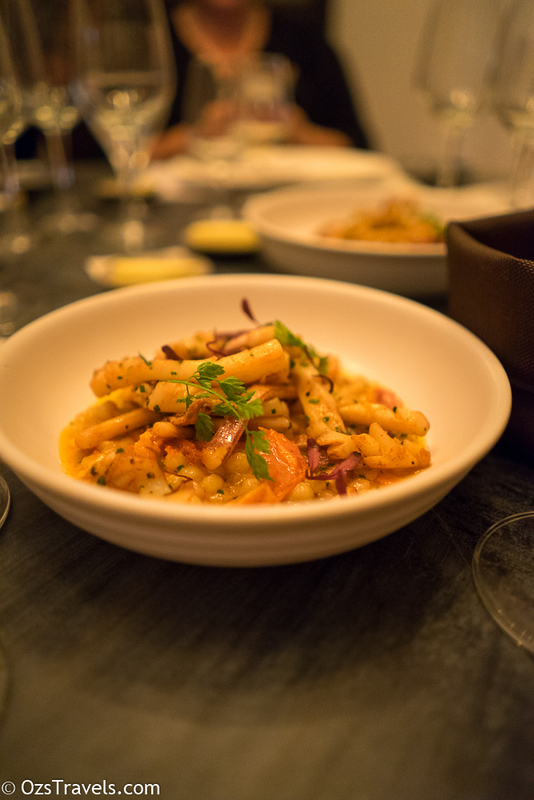 Established in 1981, the winery is situated in the historic township of Auburn at the southern tip of the Clare Valley, 100 kilometres north of Adelaide. While in its third decade, annual production is capped at 11,000 cases (dozens), predominantly produced from twenty hectares of estate vineyards. 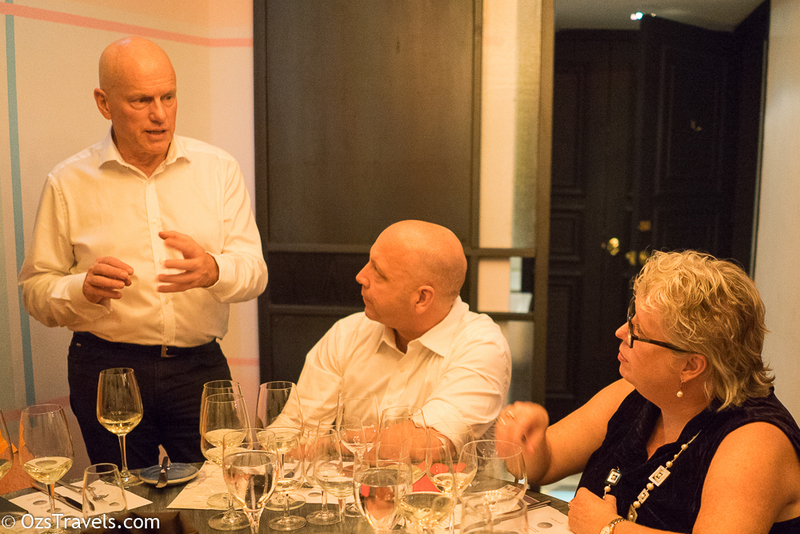 Remaining small and focused has allowed Grosset to preserve the character and individuality of the wines, developing a significant international profile by producing wines deemed consistently outstanding, benchmarks in their class. Jeffrey Grosset, owner and founder, has always been an innovator, challenging tradition and questioning accepted practices. He campaigned to institute the legal integrity of the riesling grape in Australia, was a leading proponent for the introduction of screwcap closures and privately funded research into the subject. The Springvale Vineyard is comprised of six hectares of a thirty-two hectare estate-owned property situated in the north-eastern corner of the Clare Valley’s Watervale sub-region. The thin topsoil is made up of red loams interspersed with shale over limestone, and the vines are deeply rooted in the slate bedrock. The soil is not worked and no fertiliser is used. Instead, a mix of natural and introduced grasses and clovers are allowed to grow and self-seed in between the vines. Meanwhile, the rest of the property is being progressively returned to native vegetation. This promotes greater species diversity and strengthens both the sustainability of the site and its suitability for viticulture by facilitating natural pest control and disease management. Springvale is an ACO certified organic vineyard. The relatively close-planted vines (2,500/hectare) are hand-tended with the shoots positioned vertically. The shoot and bunch density of each vine are closely monitored and the vines are trimmed manually whenever necessary. 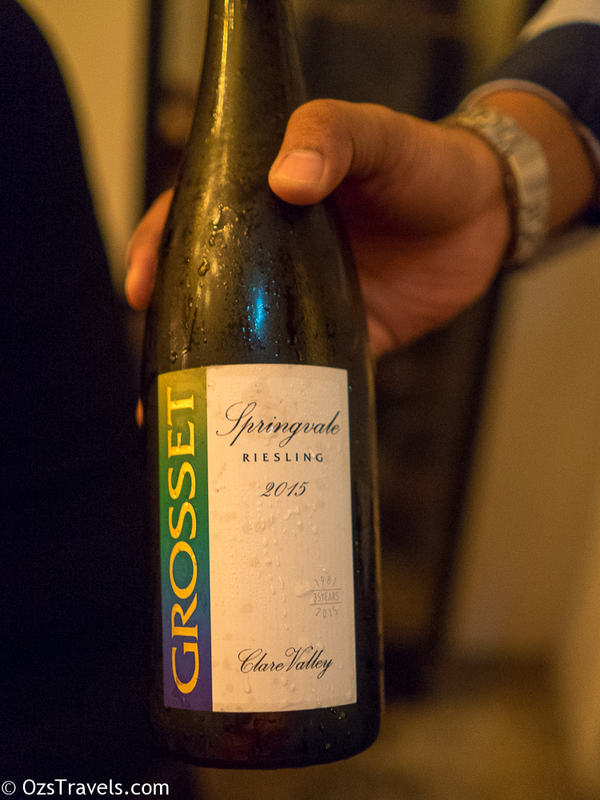 Planted entirely to three clones of riesling (two German and one of local origin) and with a high exposure to sunlight, the sturdy vines produce compact yellow-green bunches of moderate sized berries. Hand-harvesting ensures the delivery of the fruit in pristine condition. After de-stemming, the berries are split and only the free run (first cut) juice is used. This results in each vine producing an average of two-and-a-half bottles of wine. Parcels of fruit are fermented separately, depending on clone and vine age, in inert containers (i.e no oak) to ensure a purity of fruit expression. 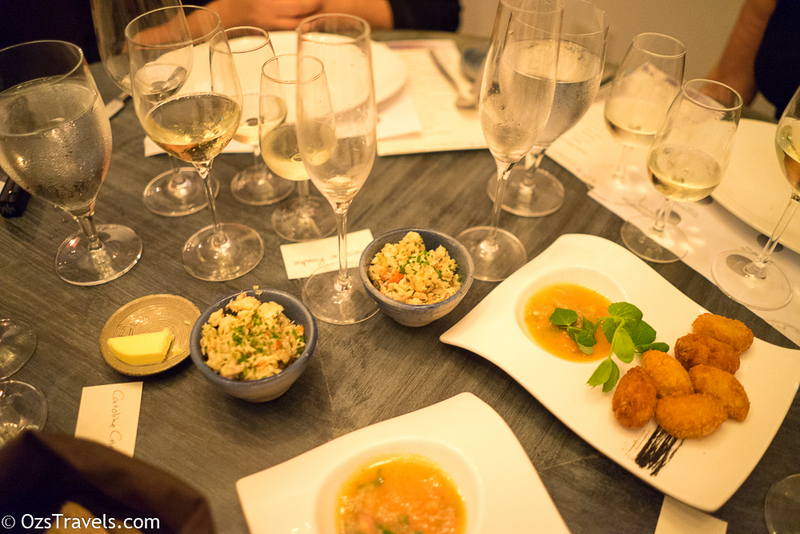 Later, the various ferments are assessed and the final blend assembled. No finings are ever employed. This was my pick for wine of the night. Great balance of the kerosene and mineral flavours that I look for in an aged Riesling, balanced palate with a medium to long finish. What “surprised” me was the youthful look of the wine, for a Riesling with this sort of nose and age would have expected the colour to have evolved from straw and to a golden hue. 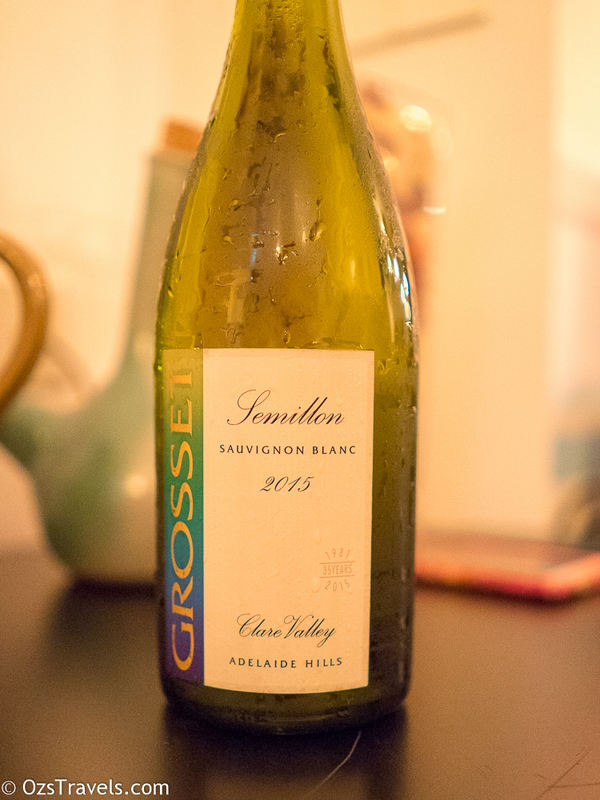 Great wine and an excellent example of Australian Riesling and specifically Clare Valley Springvale. I enjoyed this wine more than it’s slightly older sibling, it was not tart, balanced combination of citrus and mineral flavours. I expect that this will evolve into a wine a good as, maybe even better, than the 2010. Can’t wait!! 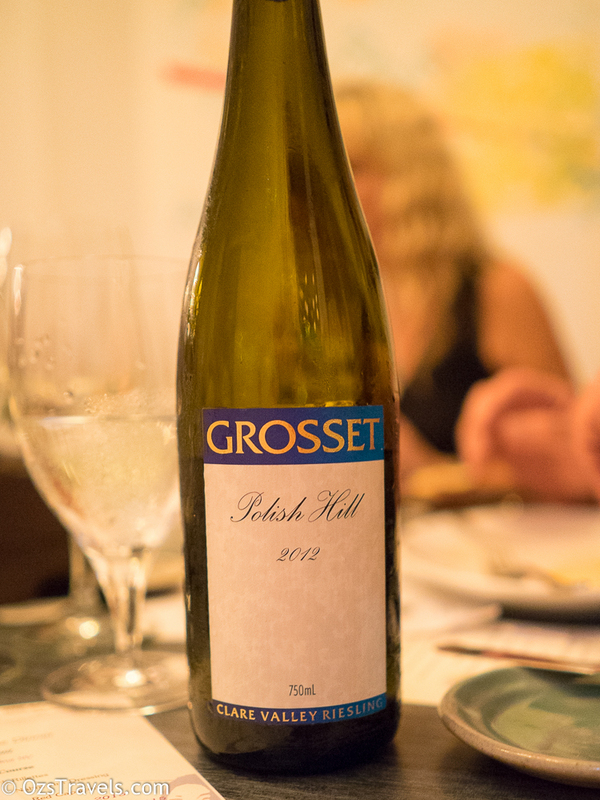 Grosset Polish Hill is produced exclusively from the eight-hectare estate-owned Polish Hill Vineyard in the Clare Valley. The gently sloping site is comprised of silt and shallow shales over a thin crust of clay and gravel. This overlays a bed of blue slate, estimated to be around 500-million-years old. This ‘hard rock’ site was originally part of a larger estate but was considered to be of limited agricultural value and so was sold off. The vines here struggle to draw nutrients from the soil, so the bunches and berries are small, and the fruit flavours lean and austere. Indeed, this vineyard exemplifies how old-rock profiles can contribute to a wine’s character. Relatively close-planted to three clones (two German and one local), this ACO Certified Organic vineyard is completely tended by hand; hand-pruning, shoot and crop adjustment and hand harvesting ensures the delivery of pristine quality fruit. No tillage is employed and no fertilisers are introduced; a mix of natural and introduced clovers and grasses are maintained between the vines and allowed to self-seed. 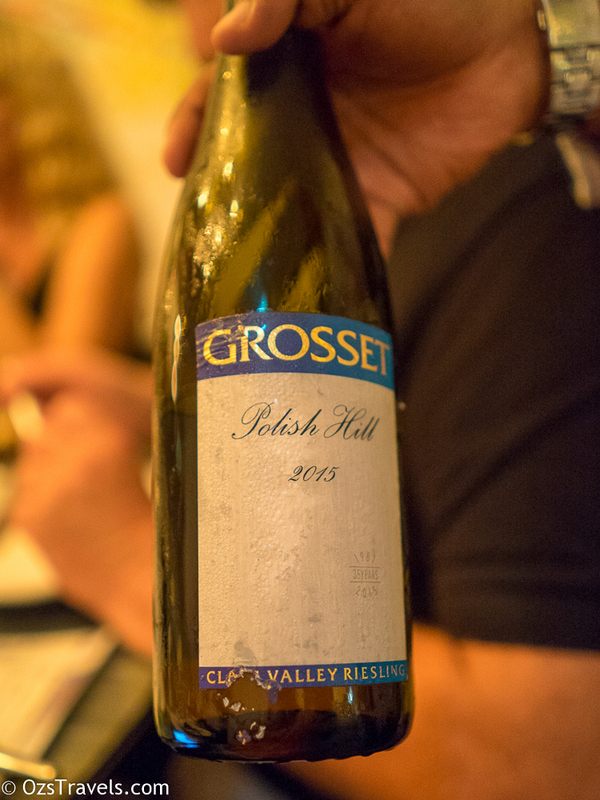 Since the first striking example of Polish Hill Riesling in 1981, Grosset has maintained a gentle and uncomplicated winemaking approach which focuses on the purity of the fruit. After harvest, the stems are removed and the thick-skinned yellow-tinged berries are lightly split, with only the free run (first cut) juice being used. This, combined with the challenging rocky profile of the site and consequent low yields, results in an average of two bottles of wine per vine being produced. The must is cold-settled before being decanted off. Fermentation and settling on yeast lees occurs over a period of months. Multiple small scale ferments proceed according to clone and vine age, and occur exclusively in inert containers, guaranteeing a purity of fruit expression. They are later assessed and the final blend assembled. Wines from this vineyard are never fined, nor is oak used. Still very young in Polish Hill terms. Expect this to evolve into a very good example of Clare Valley Polish Hill Riesling with another 10 years or more. Glad I have a few bottles in storage so that I can find out. As with the 2012 this is still a young wine, subtle citrus nose, nice balance. 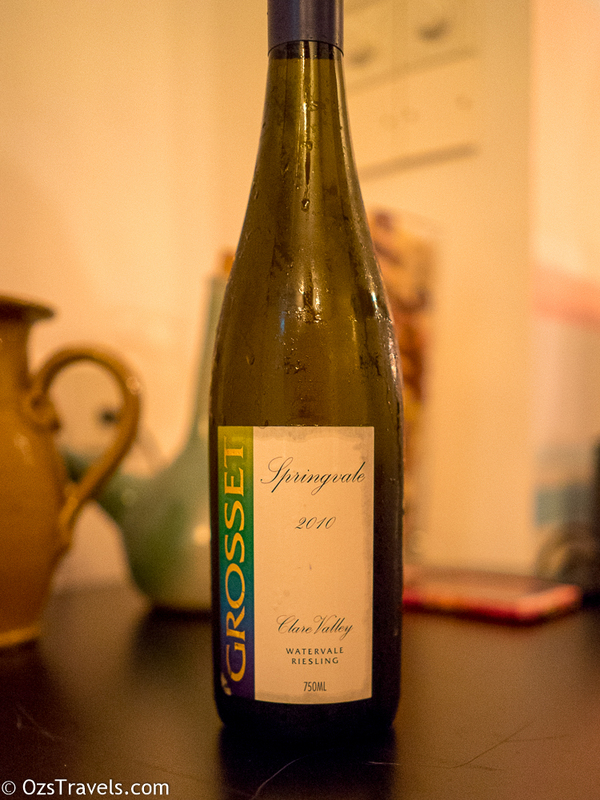 As with all of Grosset Polish Hills, one to watch. Great wine to drink now, but will develop into, hopefully, a great wine if you have the patience to wait. Which is why having my wine stored in another country is good idea for me, prevents me from enjoying a wine too early! 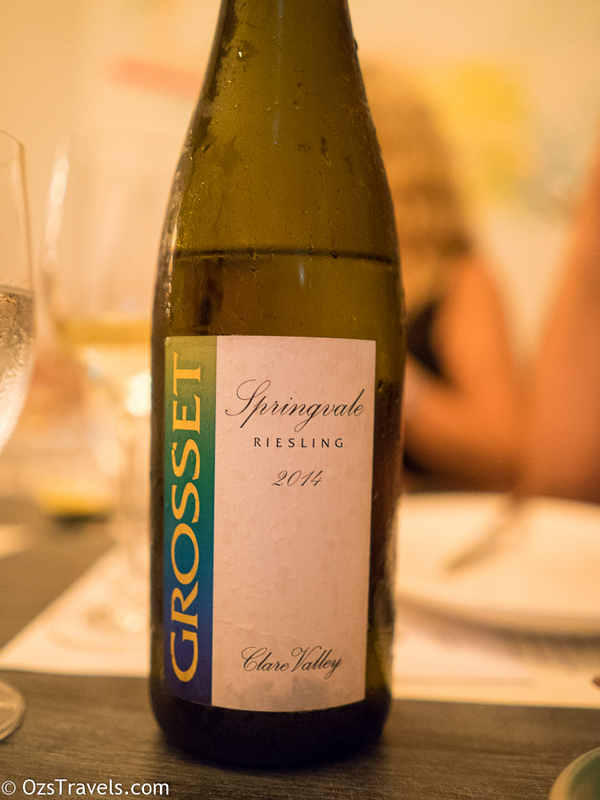 Grosset Wines’ chardonnay, pinot noir and sauvignon blanc grapes are grown in three privately owned vineyards in the Adelaide Hills. 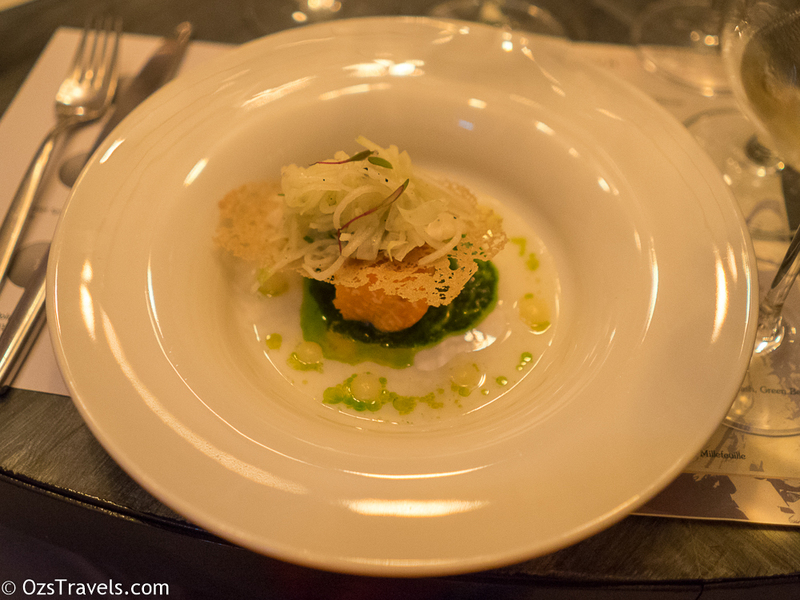 In the early 1990’s Grosset was drawn to the intriguing high-acid fruit from these sites. Two are in the Piccadilly Valley, the second coldest place in South Australia and for that reason they can be accurately described as ‘marginal’. In terms of quality however, the rewards of working with such challenging sites have proved to be substantial. 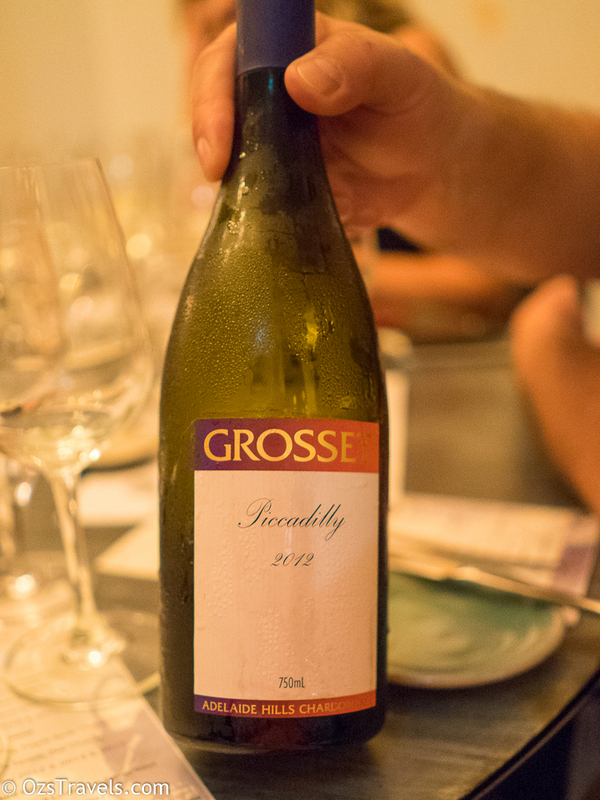 1 2012 Grosset Adelaide Hills Piccadilly Chardonnay Colour: Youthful, pale straw Nose: Pleasant combination of nutty and lemon aromas Palate: Elegant palate, citrus and lemon flavours Finish: Medium Alcohol: 13.5% I am not a great fan of Chardonnay, but I did enjoy this one. Paired well with the smoked NZ salmon. Only 400 dozen produced. 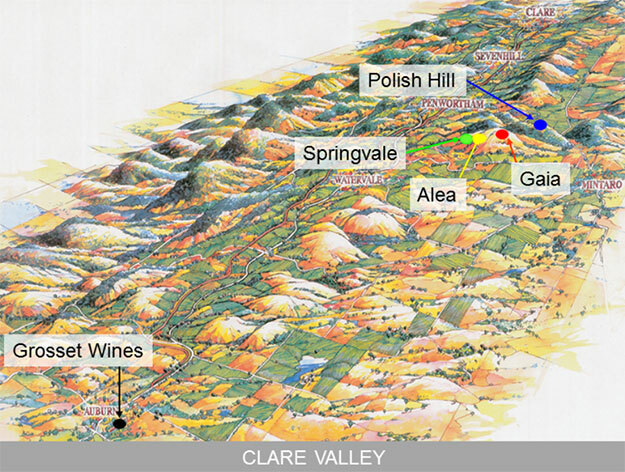 Jeffrey Grosset established his Gaia vineyard in 1986, just below Mount Horrocks in the Clare Valley, South Australia. Isolated and windswept, at an elevation of 570 metres it is the region’s highest vineyard. Grosset has absorbed Lovelock’s ecological theories and applied them to his own methods of viticulture so that today, his vineyard is hand-tended and ACO certified organic. The resilience of the vines in such difficult terrain is a testament to the soundness of this philosophy. First released in 1990, Grosset practices very straightforward winemaking techniques, believing this to be the best approach. 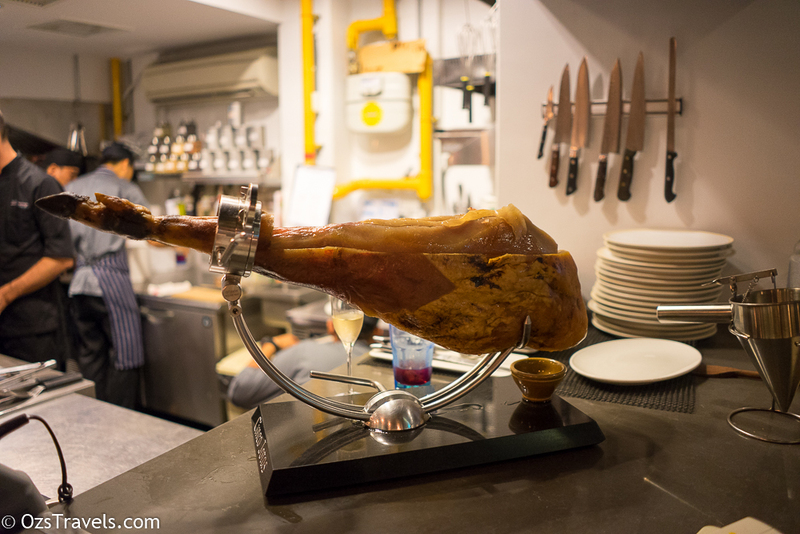 The wine is fermented in small, inert containers with the skins plunged gently and regularly over a seven day period to fully extract flavour and tannins. It is then matured in a combination of new and seasoned French oak for sixteen months before being bottled without fining. After that, the wine is further cellared for one year before its release. Our only red wine of the night. 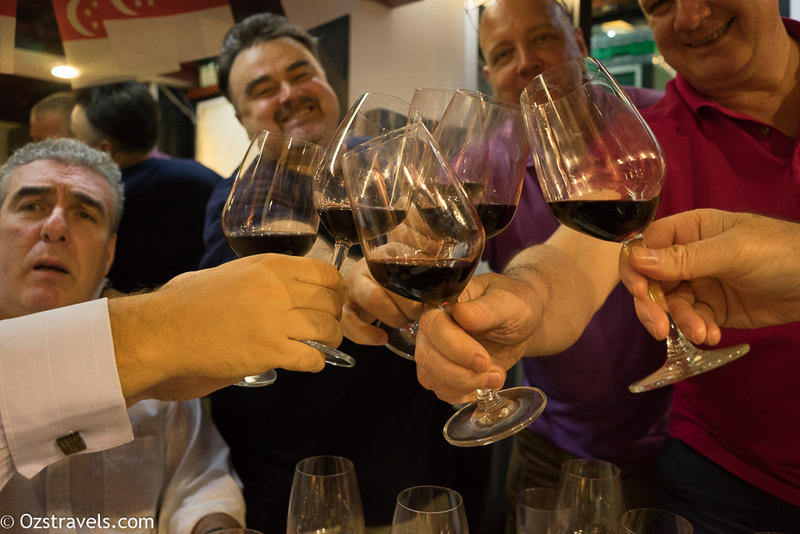 Would have, of course, like to have had the opportunity to have tasted a couple of vintages. This wine is still quite young, but starting to show how good it will be at its peak. Very enjoyable, just pipped at the post by the 2010 Springvale for my wine of the night. 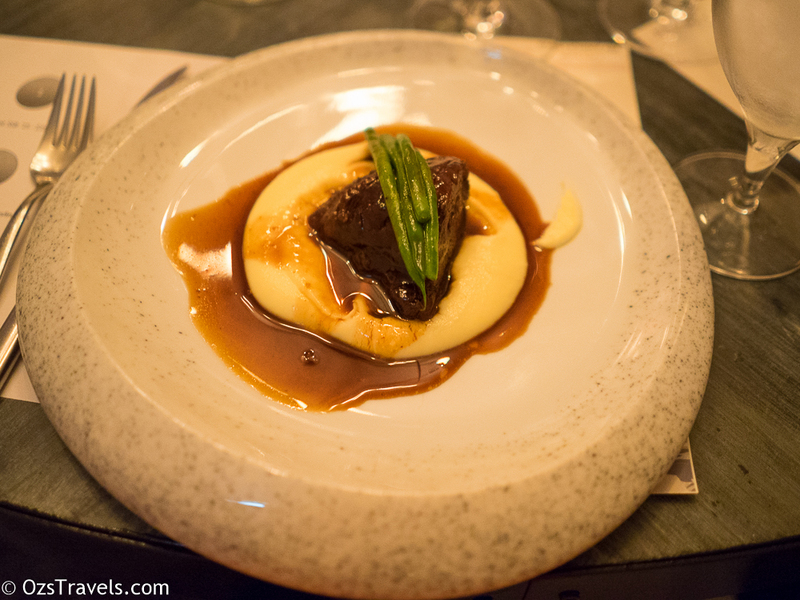 Whilst most of my fellow dinners were a bit overwhelmed by all of the white wines, I really enjoyed the dinner and wines, so much to look forward to with what is already in my cellar.